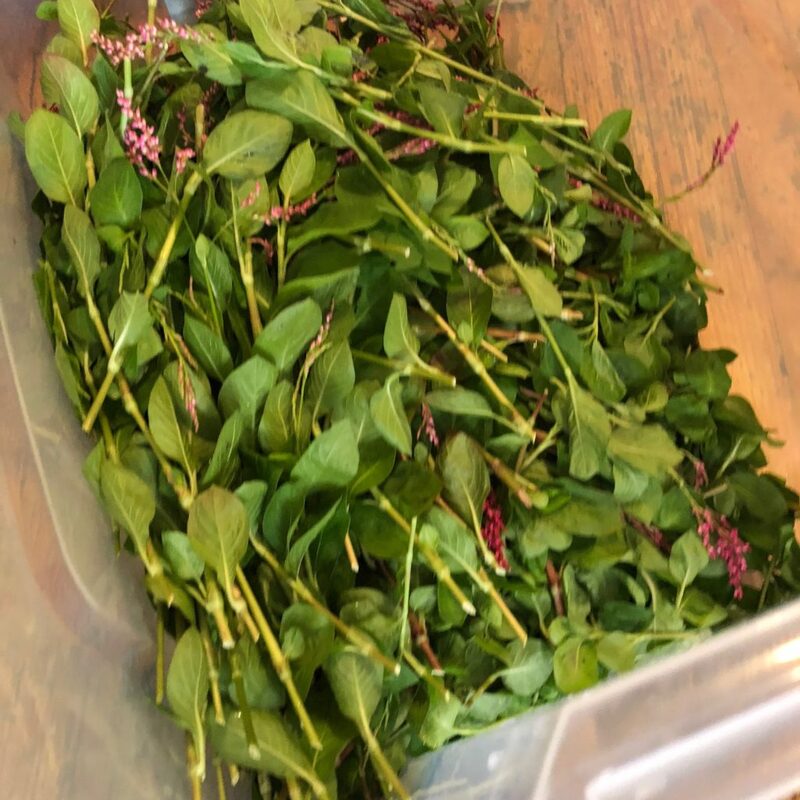 One can go straight from leaves to dye without waiting for pigment to settle to the bottom of a fermented vat. Instructions on this website was helpful. I made my own adjustments. This September, I’ve been harvesting as much indigo as I can for home dyeing before the season ends and plants wither. Technically, as they’re flowering, they are past peak pigment, yet I am continuing to harvest. 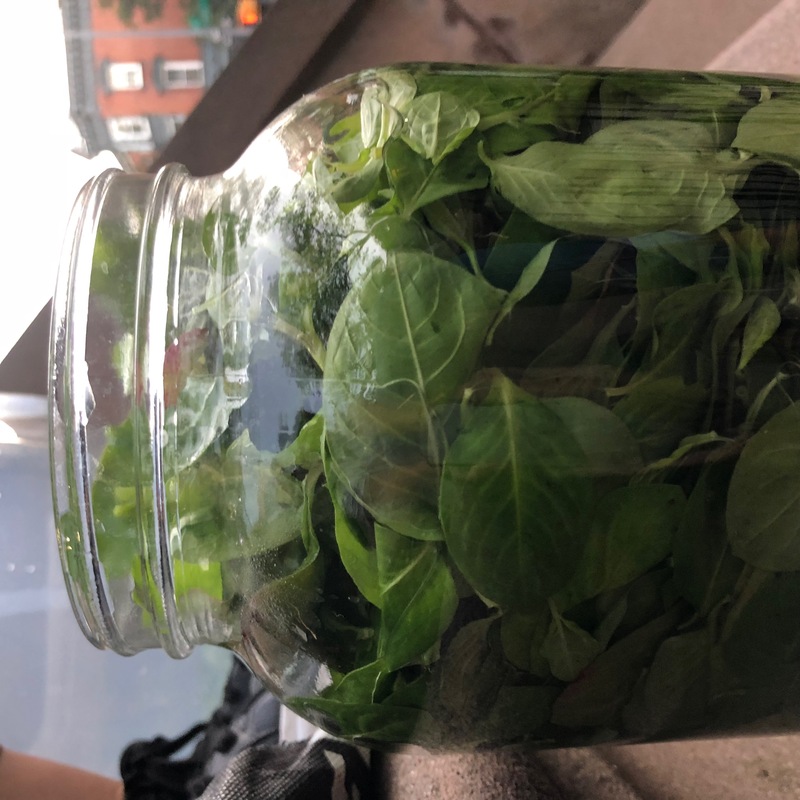 Leaves had to be pulled from stems and placed in warm water in a 1-gallon mason jar. Friends helped! We had an impromptu stoop party. Neighbors spontaneously joined us. 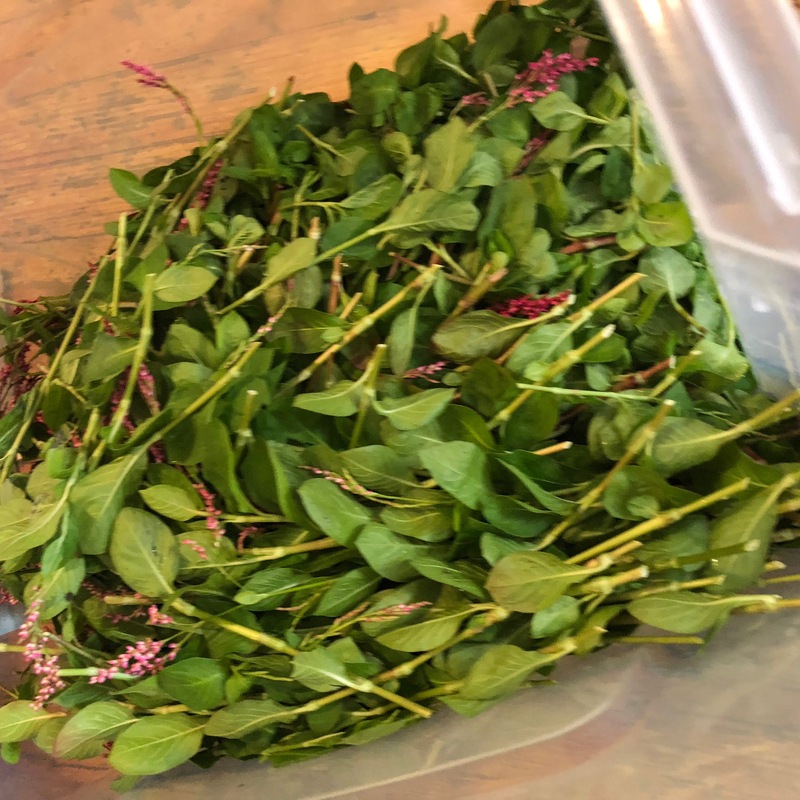 After separating leaves, we made piles of stems and flowers, which went into the compost bin. 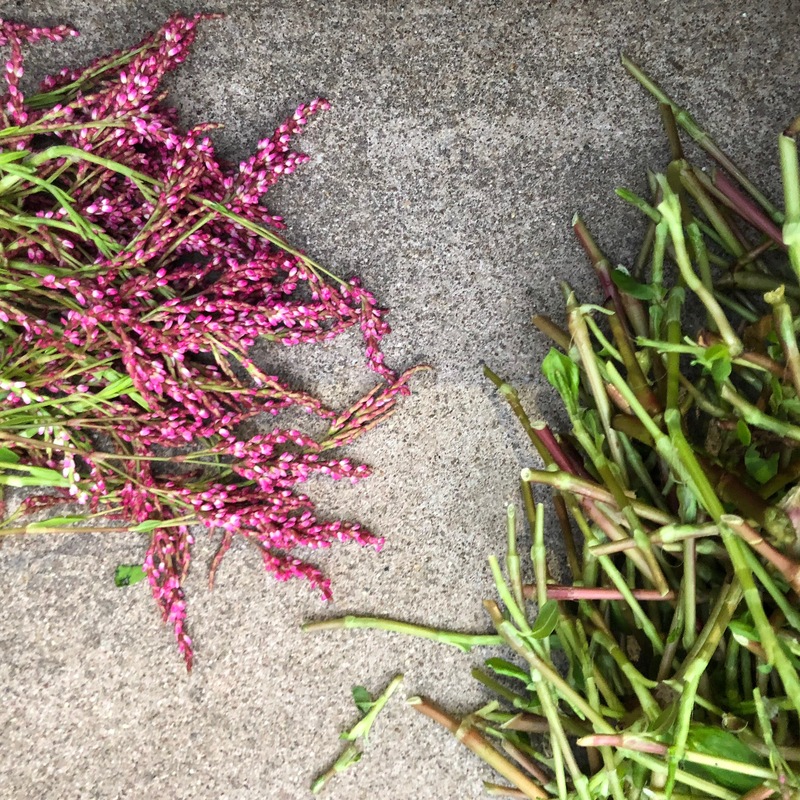 These flowers hadn’t yet gone to seed, although I’ve collected thousands of seeds! 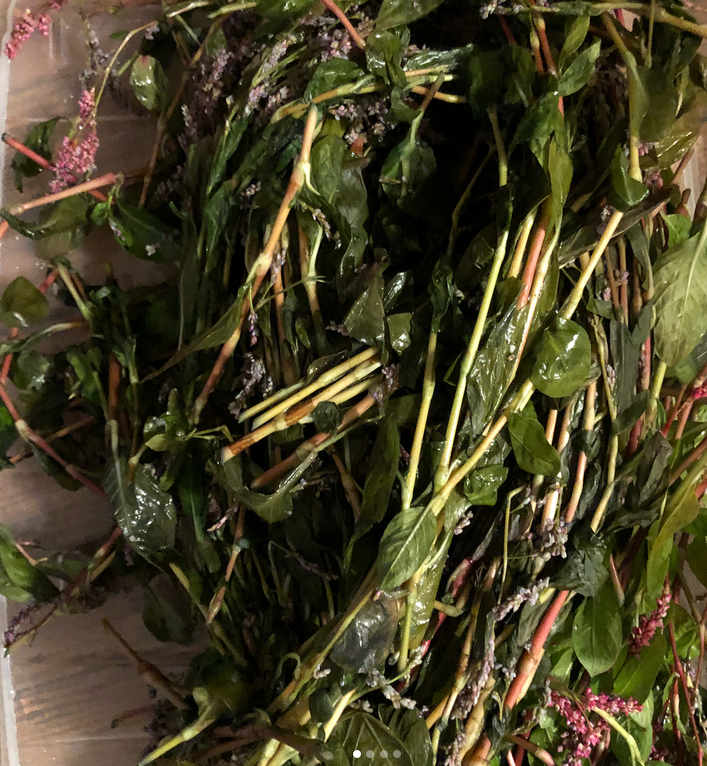 After soaking for hours, leaves are “wasted,” or wilted and yellow-brown vs green. They are also quite slimy! This is the dark, amber color the liquid turns after leaves have heated in the double boiler for 3 hours at 160°F. 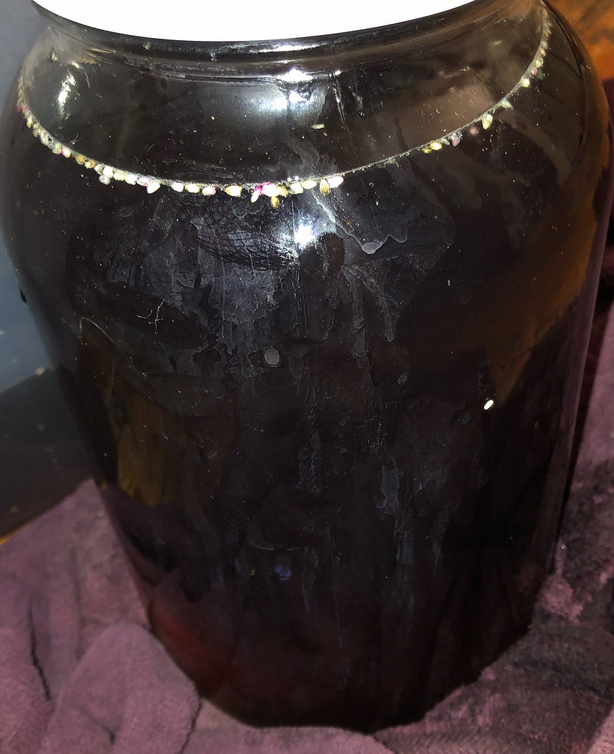 It almost looks like a dark ale — fitting, because it’s fermented! 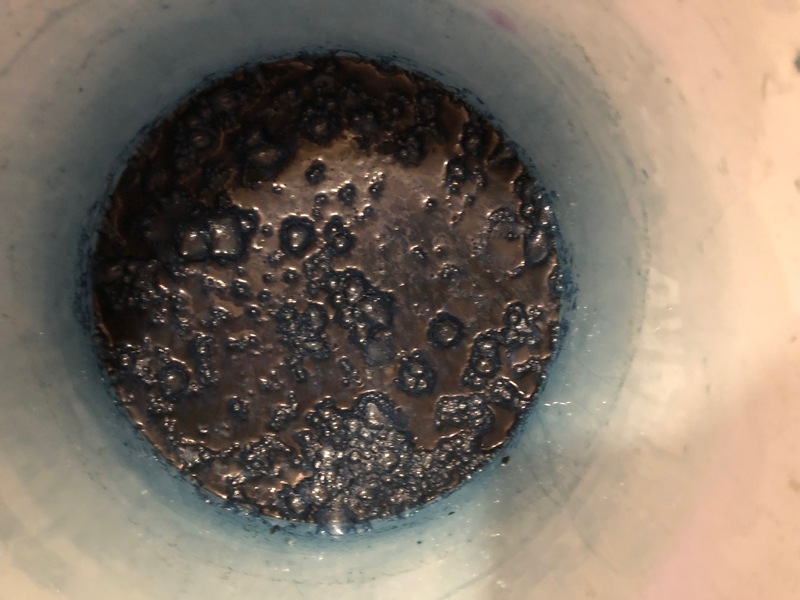 After boiling water in a large, nonreactive pot and placing the jar of leaves in the boiling water for 3 hours at ~160°F, I removed the leaves from the jar, squeezing any remaining pigment and liquid into the jar. 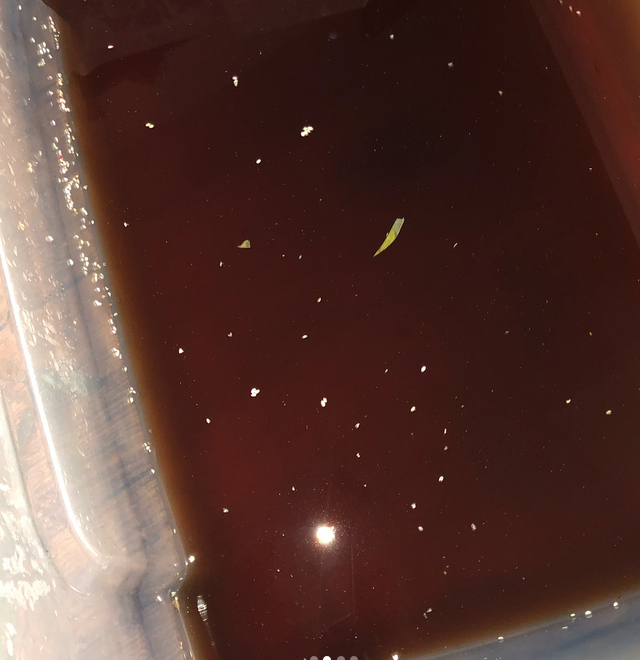 I next added 1 TBSP of Spectralite, which is basically like a synthetic urine (urine used to be used in dye making!). I replaced the jar covered in the double boiler and made sure the temperature stayed around 110–120°F for the next 10 minutes. The Spectralite reduces oxygen within the dye vat. This is necessary for the indigo chemical to be suspended in a way where it will bind with fabric. 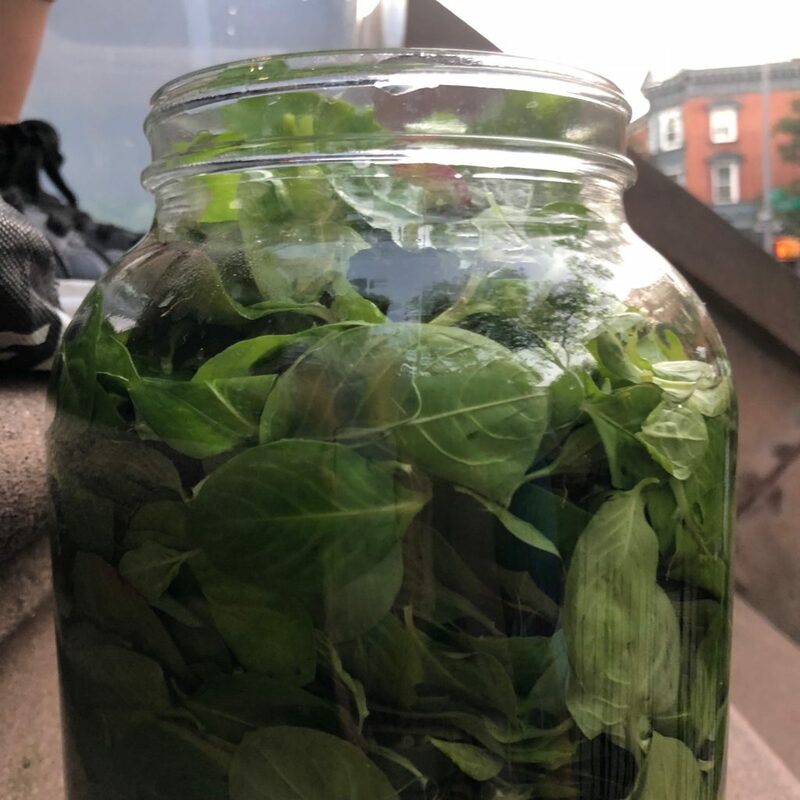 While waiting for the oxygen reduction, I wet fabrics in the warm water outside the jar, then rung them out and placed them inside the jar, careful not to splash, which would add more oxygen! 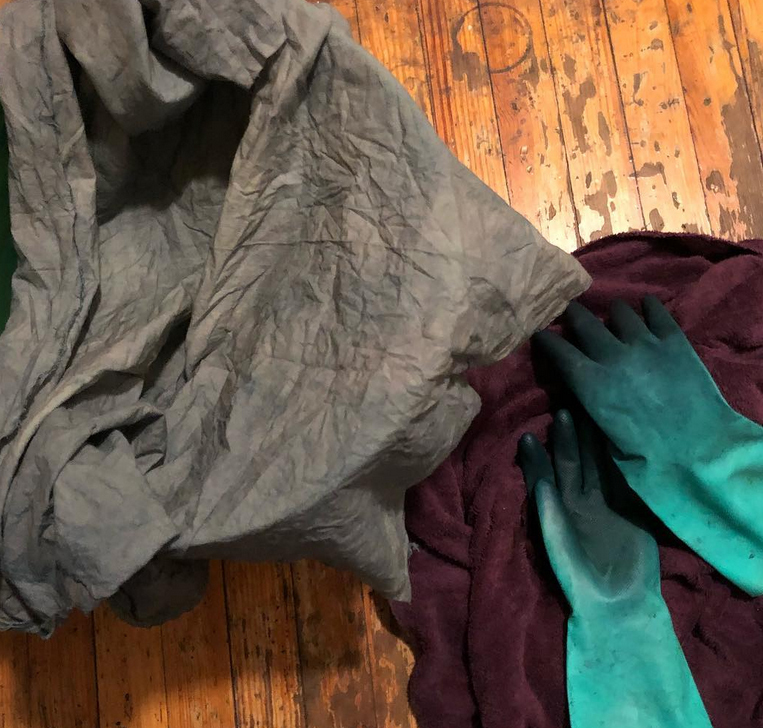 After fabric is dipped into the oxygen-reduced vat, it needs to oxidize, or have oxygen hit its surface to shift the color from green to grey. It also needs to be rinsed in water. 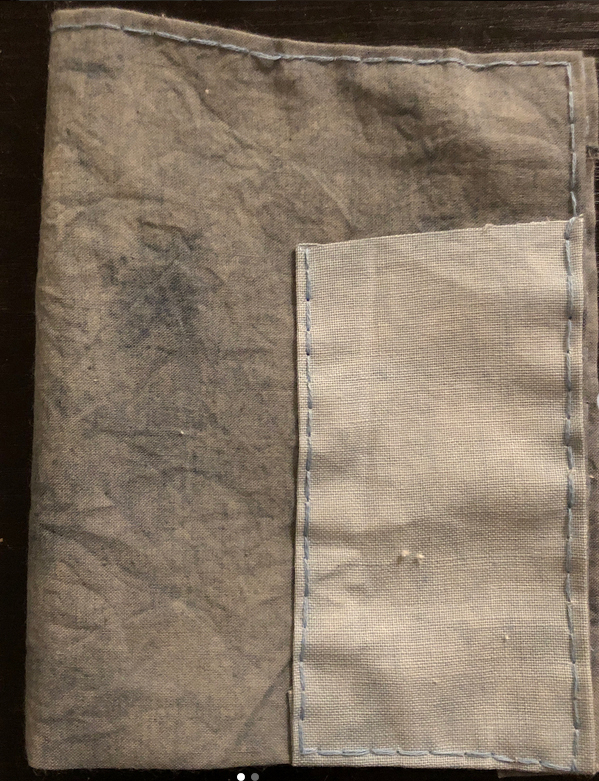 Fabrics dyed using this leaf straight to vat method are often moodier blues with hints of green and grey than the intense blue of denim. Making dye from extracted pigment is more likely to result in those darker, purer blue hues. Also, after keeping fabrics in the vat and oxidizing several times, they need to be rinsed in water with a bit of vinegar. This removes some waste water or yellow-brown hidden in the fabric. It also removes some of the alkalinity of the chemicals used in the dye vat. The alkaline chemicals are friendlier on cotton and other plant fibers than on animal fibers like silk.